After months of playing Dark Souls 3, Bloodborne, and returning to Dark Souls 2 while a bide my time- the announcement we've all been waiting for has arrived. Dark Souls 3's first DLC announcement will arrive on August 24th! Since the game was released in March, we've known that the $25 season pass would include 2 packs. One would be released in the fall of 2016, and the second in early 2017. Now we've gotten confirmation that information on the first will be presented on the 24th leading many people to speculate what it might include. Miyazaki: I’m not sure I can provide "information" without spilling the "surprise." The only thing I can say now is that we’re planning two DLCs for Dark Souls 3. The first is scheduled for release in autumn of 2016, and the second is scheduled for early 2017. We’re actually still working on the first one. Content-wise, it builds off of the previous titles and will be featuring a new area, enemies, gear, and story. The game story revolves around a new location which I believe will offer a different feel from Dark Souls 3. In addition there's been some supposed concept art leaks with potentially amazing stuff. Granted, the leaks might just be old or unused images, as there IS the Faraam armor from part 2. Although the amor DOES appear in Dark Souls 3. It's item description in 3 says, "This set is named after a god of war. The armor of the Forossa Lion Knights was preserved even after the destruction of their homeland, and is mentioned in numerous legends, alongside the names of those who are said to have gone beyond death." Those who have gone beyond death makes me question things. Then in the second image below, the locale looks like the Lothric Castle area where you meet Emma, and fight Dancer of the Boreal Valley. If it is unused art, it could be the precursor to the current entrance to Lothric with the angel-like statue possibly becoming the knight cutting his neck, and the chained woman becoming Emma. I suppose we'll have to wait and see. That city looks an awful lot like Yharnam. And that tree is amazingly creepy. Ok, I've been really mulling on this idea. I think the abyss is the dark of humanity (If I recall correctly, Manus was a man that succumbed to humanity and from that came the abyss), while the Deep was something other worldly- as we aren't told where it came from, just that it was found. Just to be sure, I DO think they have a lot of similar properties, but are derived from separate sources- the same ways there is the first flame and the chaos flame. Similar things from varied origins. Very reminiscent of where you fight Dancer in Lothric Castle. The Deep would be really cool. Although I'm curious to see if we'll ever meet Gwynevere- who like Velka- has eluded us but has had an immense presence in the series. I want to see what they've been up to. Not necessarily in Londor though. All the various gods from the Souls games like Caitha have been absent, so it could be interesting to see something else coming to power in another land. 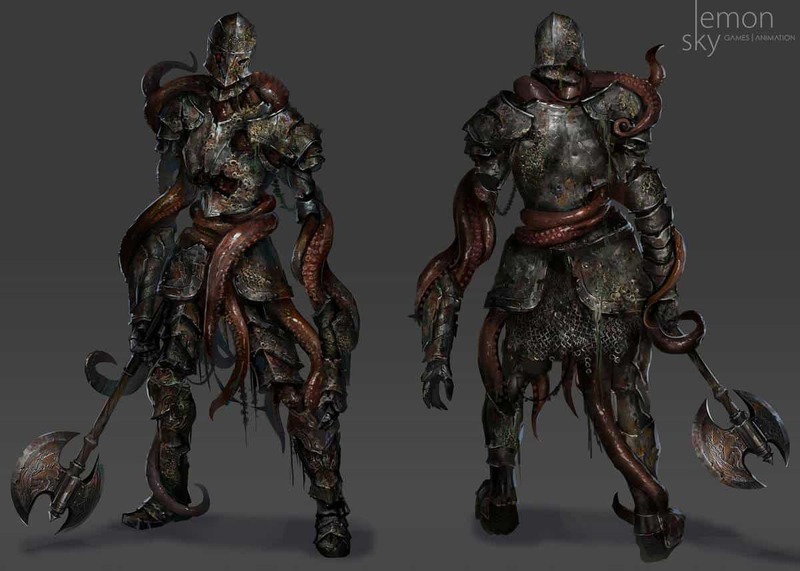 To also further my suspicions, this particular leaked concept art has me really intrigued- a soldier with some Ebrietas like tentacles. Forgot to ask- what about all the other places we haven't seen- like Vinheim, Carim, or Astora's ruins? There's a ton of possibility for the DLCs.﻿ (White Birch Branches) As with previous From DLCs they've been known to have them take place in times out of chronological order. So of course we may get any number of alternate times of places we've heard of. Regardless, whatever they have been making will be wonderful. His name is spelled "エルドリッチ" in Japanese, which is read as "Eldritch," possibly a reference to H.P. Lovecraft. Aldrich Faithful covenant pendant, "The holy symbol of the Cathedral of the Deep, and crest of those who see beyond fire to the age of deep waters." His Soul, "When Aldrich ruminated on the fading of the fire, it inspired visions of a coming age of the deep sea." The Deacons of the Deep fight has a familiar red aura that goes from Deacon to Deacon, and looks suspiciously like one from Bloodborne. Perhaps the Deep is a place we can reach through looking inward. Besides, only the souls collected that have been effected by the Deep are blue. Could there be a connection that Aldrich is keep in the highest part of Dark Souls 3 with the possibility that above him is an ocean of another realm? 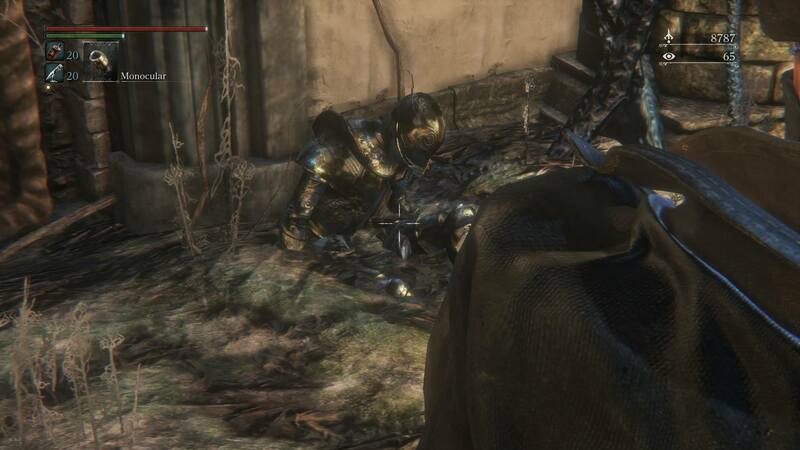 It might be a nice touch to point out there's also a recognizable suit of armor (Demon's Souls) found in the chalice dungeons of Bloodborne. "Armor made of bone ash,worn by the oldest keepers. a ceremony of flame that cremated body and soul"
And the look of the items look very much like the witches of Dark Souls such as Karla and Demon's Souls' witch Yuria. Due to the the way IPs work, I think the Souls games and Bloodborne can definitely be connected nicely, but never explicitly stated as two different companies own them- which fits wonderfully into how the games' whole story works- through pure implication.